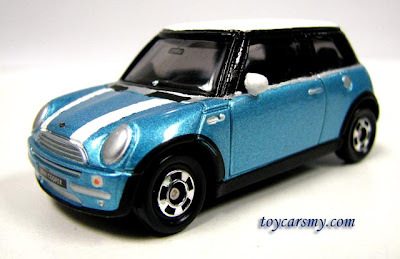 I outsourced this custom work to Elgee from Gee's Garage, a upgrade version of the Regular Mini Cooper from #43. 1. 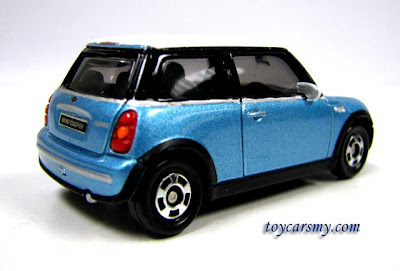 It has to be Tomica after the modification. 2. All rounded upgrade of the diecast detailing. 3. Absolute decision on what he wanted to do. He requested me to pre-drill the car before pass to him. The drilling part was painful, due to the based is metal, it took me quite awhile to has it opened. After that, there were few rounds communication on what he plan to do, and the 1st draft charges amount. He proceed the job after my confirmation. Between the progress, he sent me pictures update. I can see the car details were building up bit by bit. He rang me up for the pickup, the Mini was completed in no time! After saw the result, I didn't pay him for his work done.....Ops! I actually exchanged with something he was looking forward, I appreciate his on the quality work done. I request him to publish the work progress, please refer to his blog if you interested to know the details. We have JDMike, the master Custom Sifu from Philippines, but we do have Elgee, the Custom King from Malaysia. This is best so far I can recommend if you looking forward to upgrade your diecast to next level. He is best in Subang and PJ, and some even said KL.